What are Halbach arrays? Why would you want to use one? In this article, we explore just a few of the interesting ways to create and use these unique magnet configurations. The effect was initially discovered by John C. Mallinson in 1973, and these "one-sided flux" structures were initially described by him as a curiosity (IEEE paper link). In the 1980s, physicist Klaus Halbach independently invented the Halbach array to focus particle beams, electrons and lasers. Why would you want one? Where are they actually used? From Wikipedia: Although one-sided flux distributions may seem somewhat abstract, they have a surprising number of applications ranging from the refrigerator magnet to industrial applications such as the brushless motor and magnetic coupling. Klaus Halbach originally invented them to use as wiggler magnets used in particle accelerators and free electron lasers. Halbach arrays are also a key component of the Inductrack maglev train system wherein the Halbach arrays repel loops of wire that form the track after the train has been accelerated to speed, lifting the train. Here we show the construction of a straight Halbach array using our B888-2PA-N52 and B888-2PE-N52 magnets. These magnets are ½” cubes with a hole through the middle to allow a long threaded rod to hold them together. This makes them much easier to assemble than a plain B888 magnet. The -2PA- magnets have the hole parallel to the magnetization direction. The north and south poles are on faces where there is a hole. The -2PE- magnets have the hole perpendicular to the magnetization direction. The north and south poles are located on opposite faces that have no hole. The video below shows how to assemble one array of 5 magnets. As shown in the video below, you can clearly see that one side of this array of magnets is much stronger than the other. At right, we show the magnetic field around the newly made Halbach array using both a finite element analysis simulation (the color picture), and using our MV43 viewing film. The film shows a light-colored line where the polarity transitions between one direction and another. Check out a common refrigerator magnet! 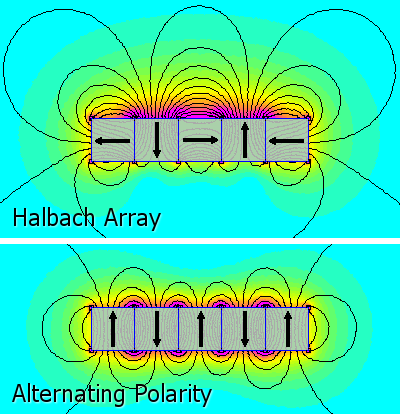 Perhaps the most commonly seen example of a Halbach array is the flexible refrigerator magnet. 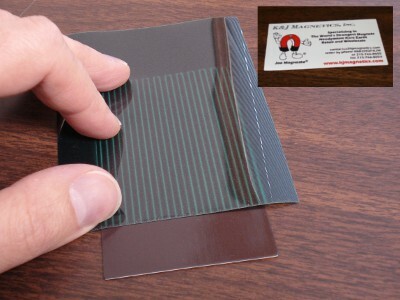 These thin, flexible magnets are often printed on for use as refrigerator magnets or on the backs of cars. They are much, much weaker than a neodymium magnet (only 2-3% of the strength), but are inexpensive and useful in this application. While K&J Magnetics does not sell these types of magnets, we thought a quick look is worthwhile in an article about Halbach arrays! After all, they are probably the most common example of a Halbach array in our daily lives. In the picture below, our MV43 green film shows the alternating magnetic fields. In the video below, we give a quick demonstration of how this flexible magnet sticks well on one side, but not at all on the other. We’re often asked about Halbach magnets because, well, they’re just plain neat. It is interesting how the magnetic fields interact, and some folks figure that they’ve got to have the strongest configuration possible. 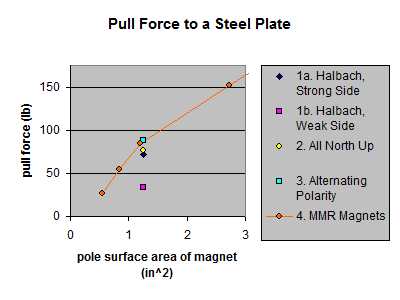 If you’re most interested in the pull force of a magnet, though, a Halbach array might not be the best solution. If you want the most pull force to a steel surface, there are stronger choices. Remember, these arrays were originally devised to make a really strong, alternating magnetic field on one side to steer a beam of electrons, not to find a stronger way to stick to a steel surface! In the graph at right, we show the results of this experimental testing. We used each of these four magnet setups on our Pull Force, Case 1 test rig, where we measure the pull force of the magnet(s) stuck to a big, thick, flat steel surface. The Halbach array pulled (on the strong side) with about 72 lb of force. While strong, a set of 5 magnets arranged with all their north poles facing up is slightly stronger, at 77 lb. By setting up the magnetization directions in an alternating (north-south-north-south) pattern, we found even more force measuring at 88 lb. If sticking to a steel surface is your goal, there is an even better option: the Mounting Magnet. Mounting magnets use a steel channel or cup to redirect the magnetic field from the backside of a single magnet, which roughly doubles the pull strength you might expect from the magnet alone. Our MMR-A-Y8 magnet measured 84 lb. Because the magnet is thinner, this turns out to be the lowest cost solution. It provides similar strength using a much smaller magnet. 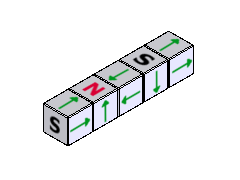 With our stock or custom magnets, you could construct a configuration like that shown in k=1 or k=4. Sorry, but we don’t offer arc segments with a magnetization direction that will support the construction suggested by k=2 or k=3. In any case, magnets in these orientations might not simply attract to one another easily. In fact, they can repel one another with a strong force, making assembly a challenge that requires fixturing, adhesives and a good dose of patience and care.